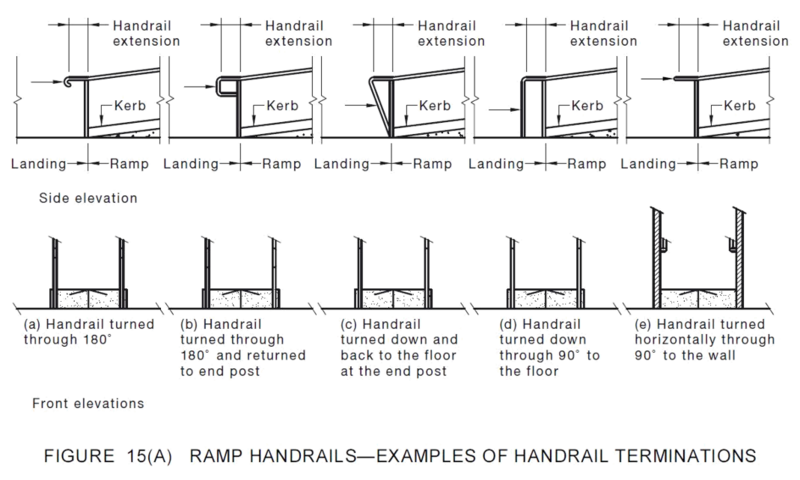 Under AS/NZS1428.1-2009 Clause 10.3, ramps shall have a handrail complying with Clause 12 installed on each side of the ramp, as shown in Figure 14. At the terminations of the handrail, the handrail must extend a minimum of 300 mm horizontally past the transition point at the top and bottom of the ramp except where the inner handrail is continuous at an intermediate landing. There are six examples of how the handrail should terminate at the top or bottom of a ramp, according to the Australian Standards. These are shown in Figure 15(A) below. The image below shows our Assistrail AR20 w/ Flexalyte on a 4° ramp, with the handrail turned through 180° closure bend at the top & bottom of the ramp.